Unfortunately, this toy is no longer being produced by Little Tikes. We are still looking for the best alternative. A pretend mailbox lets kids pretend to deliver and recieve mail. Comes with five pieces of mail including three colored envelopes and two small packages. Other accessories include a ladybug that spins, caterpillar that makes a clicking sound, and a bumblebee that makes a buzzing noise. Recommended for children ages six months to three years. A small, plastic mailbox with envelopes and packages for kids to deliver. Comes with a buzzing bee, ladybug, and caterpillar to make it seem like it’s outside. Recommended for ages six months to three years. The toy comes with three colored envelopes and two small packages that children can put inside the mailbox. They can touch the little bumblebee and it will start making a buzzing noise, or play with the other little critters on the bottom, like the ladybug and the caterpillar. The mailbox comes with five pieces of “mail”. There are three colored envelopes and two small packages. Users have said that these accessories are big, which make it easier for small children to handle them. The toy also comes with a ladybug that spinsd around, a little caterpillar that makes a clicking noise, and a bumble bee that will make a buzzing sound if it is touched. By opening the mailbox door and taking mail out, children can work on their basic motor skills. Also, many of the parts on the mailbox are removable so that children can play with them separately. However, they can easily be reattached to the toy. 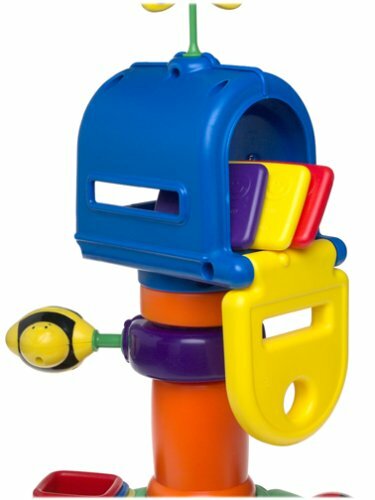 The mailing envelopes and packages can all be stored inside the mailbox when the toy is not being used. If touched, the bumblebee on the mailbox will start to buzz. Some users had complaints that the noise was too loud, and that there’s not volume control button to make the buzzing quieter or stop it. Also, because it’s not heavy and since the bottom of the mailbox is not weighted, some have said that it tips over very easily. In some cases, there have been complaints that the mailbox lid was hard to open and close, so children had difficulty putting the mail in and taking it out because they couldn’t get the lid open. The toy comes with a plastic base, mailbox, ladybug, caterpillar, and a bumblebee. Accessories also include three colored envelopes and two small packages. Users had concerns that since the base of the toy was not weighted, it tipped over very easily. Some reviewers said that the toy fell on their child when they were trying to grab something from the top or they were trying to climb up on it. However, they also said that the toy is fairly light, so if it does fall, it causes no harm to the child. To prevent the toy from falling over, we recommend keeping it on a completely flat surface like a hardwood floor and being gentle with the toy. 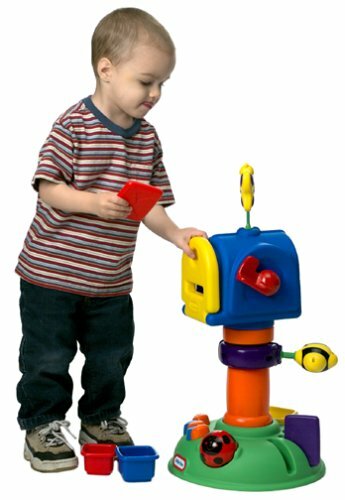 Your little one will enjoy busy, buzzy fun with this Little Tikes Buzz About Mailbox full of learning and skill activities. They'll love to mail and retrieve letters from the box, or play with the colorful clicking flag and "bat-about" butterfly and bee. The base stores the nest-and-stack packages, and is decorated with a playful spinning ladybug and a cute clicking caterpillar. 23-1/2Hx12Wx12D".